Projection from a toy planetarium. Design using an image program. Astronomically correct full ceiling stencil. You don’t need to go out and spend a fortune on a planetarium. You can find them at Target, and WalMart but I picked mine up at a Discover store. Expect to spend about $30 for one. If you can, try to find one that projects stars with different intensities. Stand in the center of the room and adjust the planetarium to project the image that you like. You’ll notice quickly that the planetarium projects a horizon to horizon image. If you do not want to paint all the way down the wall use a ladder or table to position the planetarium at the height which gives the image you want. This method is quick to setup. However, the projection always caused the constellations to get a little warped. Also some constellations only appear close to the horizon making it very hard to project those images onto the ceiling. It’s a pretty good system which works better in larger rooms. If you plan on doing this then you should obtain an image program that provides multiple layers. This enables you to create a layer for the grid and then separate layers for the constellations. GIMP and PhotoShop are both great tools for this exercise. The key to this process is having a library of constellation images that you can cut/paste, drag and drop. You can make your own from the myriad of online resources or you can obtain them from me. Take a tape measure and measure out the room in feet. Then using GIMP or another program create a new image and layout a grid. I create a grid where each square represents 1 square foot of the ceiling. Now you can drag and drop constellation images around until you have the layout that you like. Now mark out a grid on the ceiling, and use the template to assist in placing the stars. 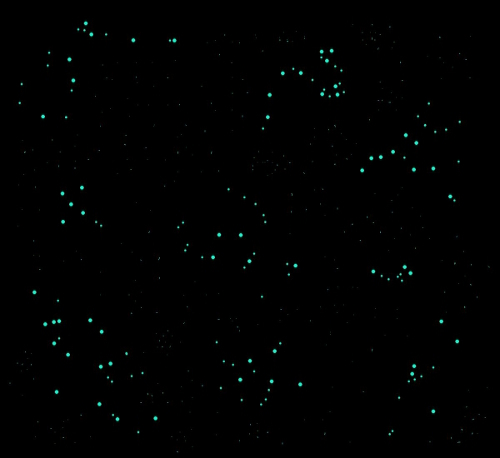 By playing with the colors you can create a virtual image of the glow stars in place. This method will save you a ton of time when it comes to painting the stars. However, it will take a while to set it up. Although given time you can get this method down and have it done in less than an hour. Handitak, Blu-Tak or something similar. Using the masking tape layout a grid that matches the grid used on your template. Now get up on your ladder. Tack the template to the ceiling in the area you are working on. Now using Blu-Tak stick small pieces where the stars will be painted. Work your way around the ceiling until you’ve placed all the stars. The reason I do it this way is that after I’ve finished I can look at the placement of the Blu-Tak stars and decide if I need to make adjustments before painting. Once you’ve done this you are ready to paint the stars. I like to paint the start to the right side of the BluTak star and remove the BluTak as I go. You could also remove the BlueTak and paint a glow in the dark star in its place. Use whichever method you like. However, if you leave the BluTak in place while you paint then be consistent as to where you paint. I personally place all stars to the right of the BluTak star. If you are creating something truly custom and do not have stencils then this is great. You can create a set of room designs in advance so the only effort you have left is to transfer the image to the ceiling. The very first time I did this it took me about 90 minutes to put the grid on the ceiling and layout the stars. Then it only took about 20 minutes to paint the stars. Add another 15 minutes for background stars and 15 minutes for tear down and this 12x12 room too about 2:30 hrs to complete. It took me a while to get around to making some stencils at the scale that I needed. However, once I did this my life changed. Stencils are the best investment in time that you’ll ever spend in this business. You can create stencils for everything at any size. All you need to do is tape the stencil to the ceiling and paint away. There are 88 constellations of which some are just a couple of stars. 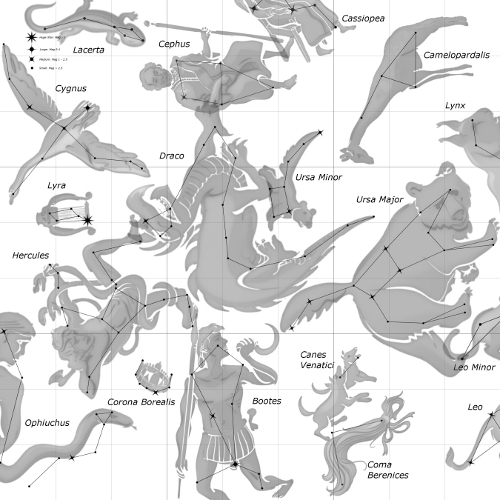 I have templates and stencils for all 88 constellations. Most people just want glow in the dark stars on their ceiling with some recognizable constellations. If you have a bunch of stencils made up then all you need to do is move them around on the ceiling until you have them in a nice arrangement and paint. 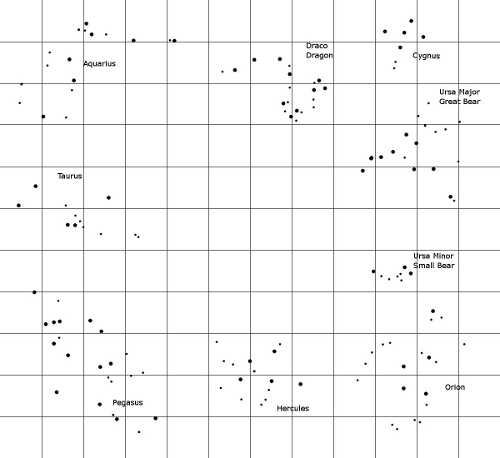 You could also use a star map to help place the stencils in their astronomically correct locations. Almost all of my jobs are done this way. Placing the stencils on the ceiling takes no more than 15 minutes. The only faster method would be to have the expertise to freehand the entire ceiling or limit yourself to the capabilities of the planetarium projector. This essentially is done by using a template to show where to place the individual stencils, or where to place the stars freehand. I have several templates available that showcase the major constellations and all the signs of the Zodiac. However, you could use any star chart to assist in placing the stencils. Here’s an example of one of my “Stars of the Sky” templates.